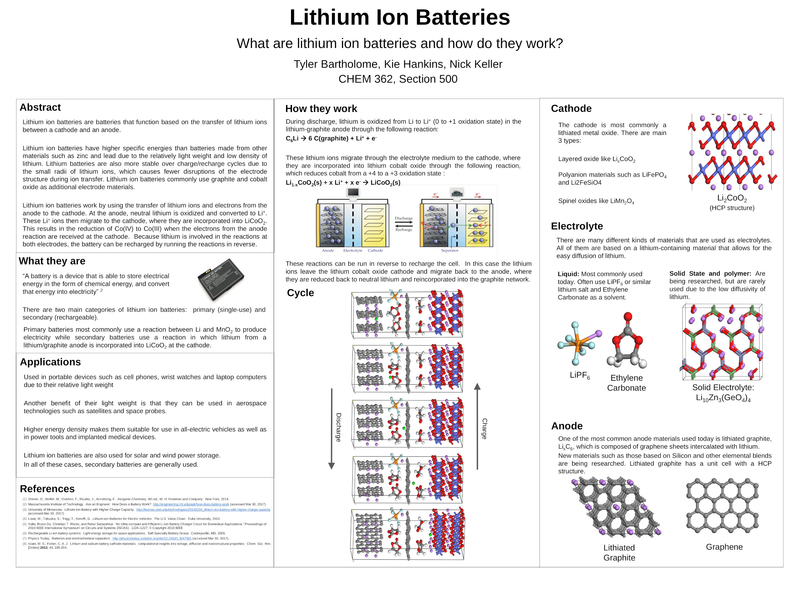 Are chemical reactions involved in charging and discharging Lithium Ion batteries? Lithium Ion batteries are interesting in that they work by shunting lithium ions between the anode and the cathode. The electrolyte has no part in the chemical reaction besides offering a conduit for the transfer of the lithium ions. This differs from say a lead acid battery where new chemical compounds are formed with some of the reactants coming from the electrolyte and some of the products going back into the electrolyte. The big question is are the processes that make a lithium ion battery work chemical reactions or just physical processes? One way to look at this is to ask the question, where does the energy you put into a lithium ion battery go when you charge it and where does it come from when you discharge the battery. Interesting question, since the ions are stored in a graphite silicone compound (carbon) anode released from the Li metal oxide anode during charging, with the reverse occurring during discharge and the electrolyte acting solely as a conduit, not as an active component, the best way I could describe it, is an electro covalent manipulation. On the other hand because the attachment of the ions to the carbon material, graphite for example, which takes ~ six atoms to store one ion, depending on the compound used, the attachment would thereby change its molecular structure, until relased, thereby it could be defined as chemical. Very different to other battery types which use the electrolyte as an active chemical component. Haha, a big controversy on another forum. I don't have a dog in that fight but the original poster's name came up during that discussion. I did offer a Brittanica definition that ion transfer is a type of chemical reaction. Redox was another term used. It is a big plus that you can have a discussion about things like this without any abuse on this forum! I think you are far more likely to get reliable information in a forum where differing views can be discussed openly and politely and abusive behavior is not tolerated. The simple proposition that the lithium ions just shuttle between the anode and the cathode doesn't answer the question of where does the energy come from or go to when discharging or charging a lithium ion battery. The bond energies of the reactants on the left hand side will be more than the bond energies of the products on the right hand side. 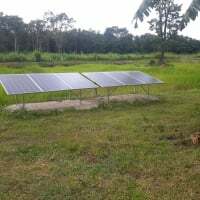 The difference will be the energy that has been extracted from the battery. I thought the student paper I mentioned in my last post was such a well written and accessible document that I have reproduced it here. The question I have is if there is a chemical reaction which can be interpreted as oxidation, bonding or whatever at the molecular level, what is actually happening at the atomic level, where electrons are shared between shells of atoms forming bonds within the valiencis of the host atoms. In order for something to attach, there needs to be a covalent bond https://en.m.wikipedia.org/wiki/Covalent_bond or free spaces within a shell/shells to which other atoms can attach and share the respective electrons within the valiencies, to provide a bond. Take for example salt, an essential to the human diet, it is composed of sodium and chloride, both in and of themselves are poisonous but in combination, through covalent bonding they are not..
Do I accept it at face value, or look deeper? For what happens with LFP batteries, I recommend the ~1-hour long youtube video "LiFePO4 battery 101". General LI-Ion battery chemistry is discussed.